Hello, all my ribbon loving friends! 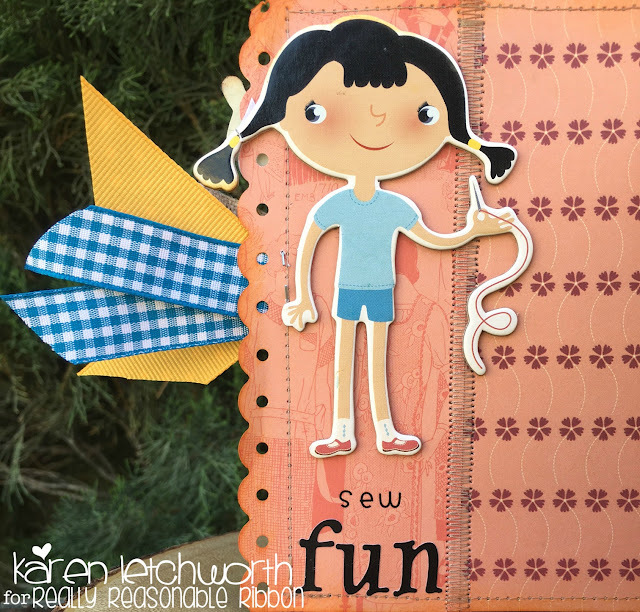 Karen Letchworth posting today and sharing a Paper Bag Album that I created to share with you all. 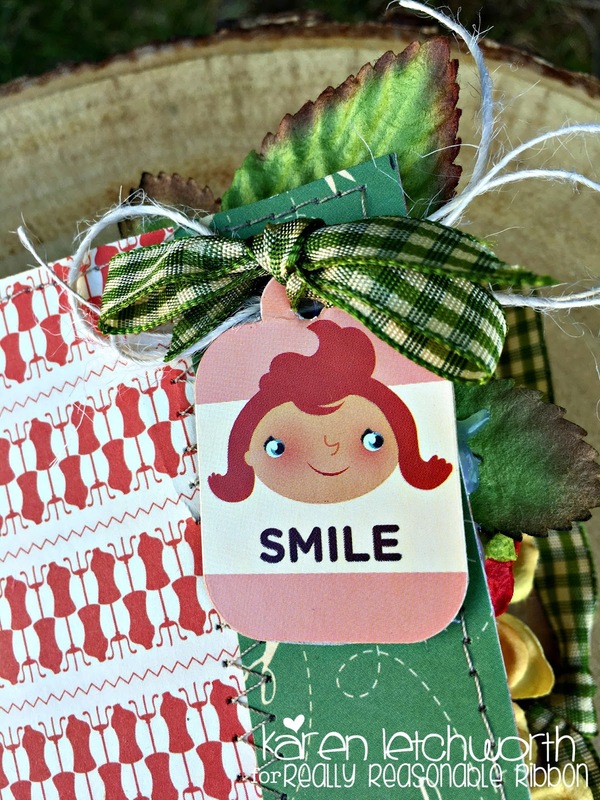 I used three brown paper lunch bags that I covered in patterned papers, reinforced with cream card stock to bind, and then machine stitched to secure. Then, I got busy decorating it with several of my favorite products from Really Reasonable Ribbon. On the cover, you will see Solid Ric Rac, as well as a snippet of Burlap Center Stitch Green, Turquoise Plaid Ribbon, and Sunflower Swiss Dots Grosgrain. Page Three doesn't have any trim. 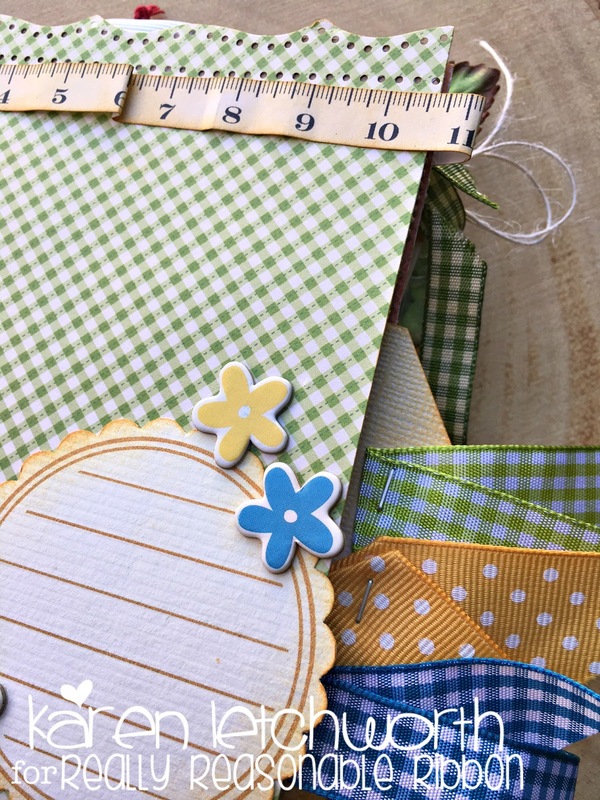 However, it has a pocket that holds a photo/journal tag that is trimmed with Turquoise Plaid Ribbon, Sunflower Swiss Dots Grosgrain, and Celery Green Plaid Ribbon. I just love seeing those gorgeous ribbons peeking out the other side. I also took a close-up photo of Page Three (below) so that you can get a better view of all the fabulous ribbons and trims peeking through from the tag tucked in the pocket next to this page, as well as some Ivory Burlap String, some Mulberry Paper Leaves and trims from the next page. 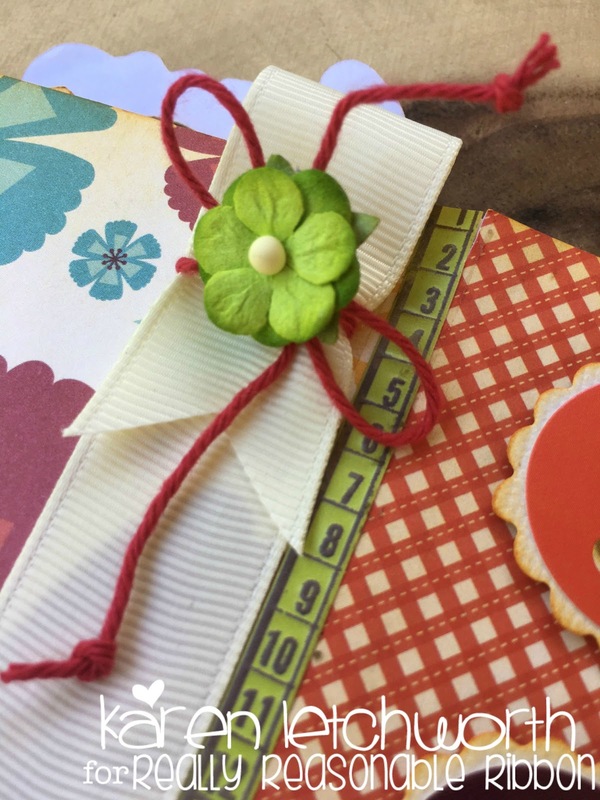 Page Four has a length of Ivory Grosgrain Ribbon that I ran down the middle of the page and looped at the top singed with a length of Solid Red Baker's Twine and topped with a Two-Toned Green Sweetheart Blossom. 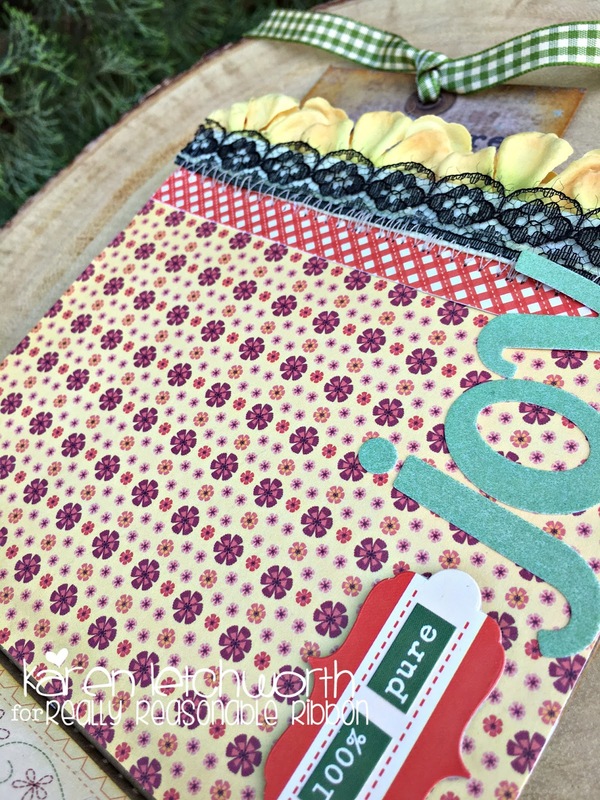 Page Five has small tag that is tied with 3/8" Plaid Moss Green Ribbon and has some Ivory Burlap String tucked underneath it. I'm only sharing the close-up photo of this page because there's no other trim on this page. The rest of the page is open space for another photo or journalling. Page Six (below) is covered with patterned papers and decorated with some Mulberry Paper Leaves, Ivory Burlap String, paper flowers, (and I used the darker red ones found in the Red and White Mixed Sweetheart Blossoms). 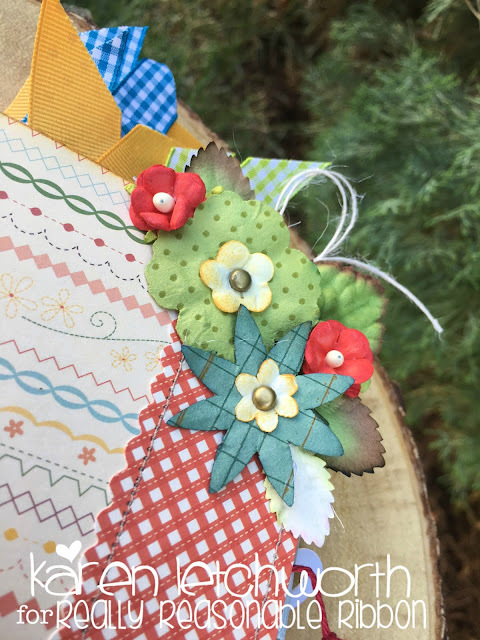 I took a closer photo of all the pretty Red and White Mixed Sweetheart Blossoms, Mulberry Paper Leaves, Ivory Burlap String and Mulberry Flowers I used on this page. 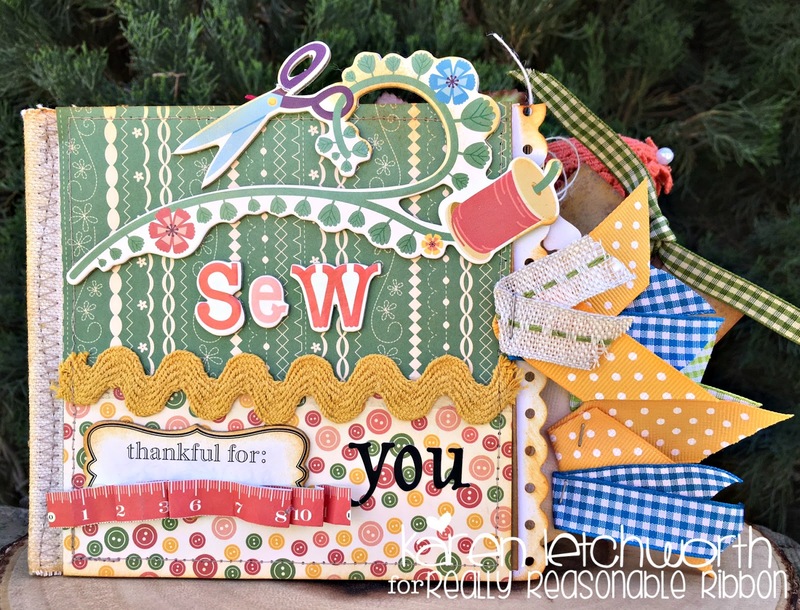 Really Reasonable Ribbon has SO many great ribbons, trims and goodies that you will always be able to find the perfect colors for ANY project you're working on, I encourage you to check it out for yourself at Really Reasonable Ribbon. 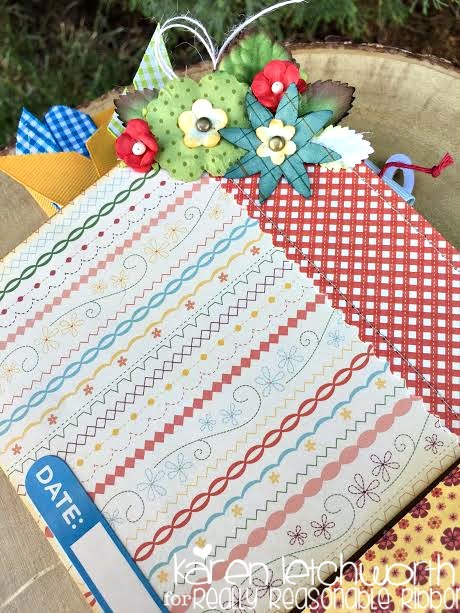 Making paper bag albums is easy and fun, and Really Reasonable Ribbon can help you find all the perfect ribbons, trims, twines, flowers and embellishments for EVERY project. Be sure to check out the Really Reasonable Ribbon Shop, and also come play along in the current challenge on the Really Reasonable Ribbon Blog. Pretty details filled with love!